Many years ago (ok, not TOO many. I’m not that old! ), a former roommate introduced me to a chocolate chip cookie recipe that changed my life. It had Jell-o pudding mix in it and that ingredient transformed my cookies into soft, tender, cake-y piles of goodness. I’m not a huge fan of crispy cookies. I like more of a gooey texture and this recipe certainly delivered! Well, I had yet to find or create a recipe that duplicated that texture in an easy gluten-free chocolate chip cookies. Until last week. I have finally perfected this recipe! This recipe isn’t Paleo, unfortunately. I used a gluten-free flour blend that has rice (and garbanzo bean, I think) flour in it but I may experiment later with a Paleo version. 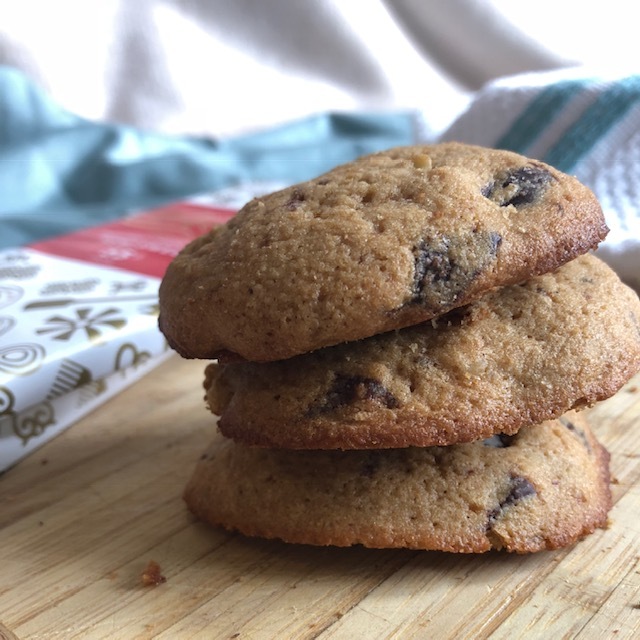 But in the meantime, these easy gluten-free chocolate chip cookies will blow. your. mind! They did for me! Even my team at work, that aren’t gluten-free, raved about the texture! They’re also the easiest cookie recipe to make. 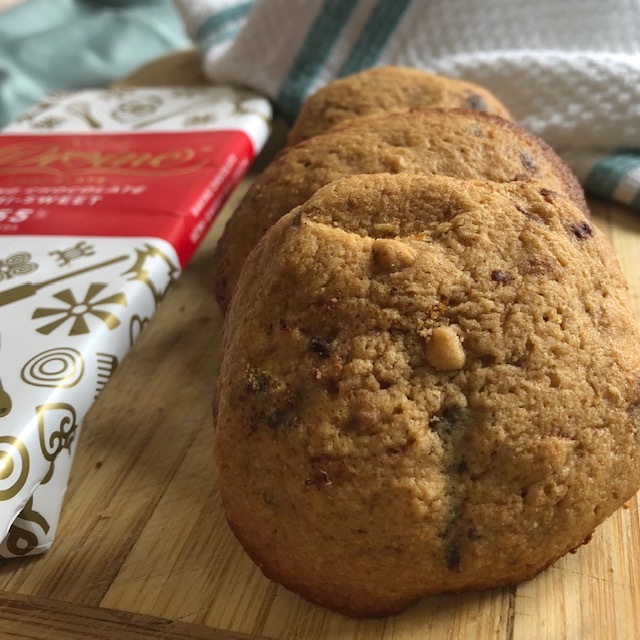 One bowl recipe with no refrigerating means you’re eating warm chocolate chip cookies in no time at all! Divine Chocolates is yet another of our fabulous #choctoberfest sponsors and their chocolate bars live up to their name! They definitely are “divine”! I was sent both their 55% semi-sweet chocolate and their brand new 100% bittersweet baking chocolate. While this recipe features the 55%, I hope to get my other recipe up by next week that showcases the 100%. Because that one is spectacular. You would never know you were eating 100% cocoa. It’s so creamy and delicious! Most 100% chocolates are very grainy and leave your mouth feeling like sand. Think eating a square of Hershey’s bittersweet chocolate. You know the one, those squares you usually use in brownies? Well, this chocolate by Divine? NOTHING like that! 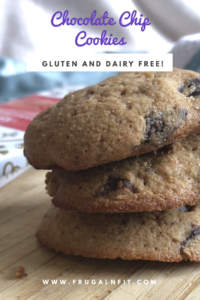 And with no added sugars or dairy, they’re Keto-friendly and vegan to boot! How great is that?! Divine is also the only fair-trade chocolate company owned by actual cocoa farmers, which I think is pretty cool! Thank you Divine Chocolates, for your generosity and sponsorship of this year’s #Choctoberfest! We couldn’t do it without you! Don’t forget to check out my fellow #choctoberfest bloggers and some of their amazing recipes below. We’ve got quite the line-up for you all! 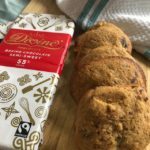 And as always, you can still sign up through Saturday for our giveaway if you’d like the opportunity to win some FREE chocolate from Divine and other great prizes! Find the RaffleCopter instructions on my first #choctoberfest post HERE. Grease a cookie sheet or line with a silpat. Set aside. Using a stand mixer, combine coconut oil, coconut sugar, and vanilla. Add eggs to mixture, one at a time, and stir to combine. Combine all dry ingredients (except chocolate and nuts) together and add to wet slowly, stirring in between. Add chocolate chips and walnuts last and fold in gently. Bake 9-10 minutes until middle of cookie is just set (don't over bake!). Remove cookie sheet from oven, let cool and serve. This dough can be refrigerated for 2-3 days or frozen for 1-2 weeks.